Working on Yuxwch’ee Yakw, the Spruce Canoe. Source: Sealaska Picasa page. Most people are familiar with the use of red cedar to make dugout canoes on the Northwest Coast. It is not as commonly known that Sitka spruce was also used for this purpose, especially on the northernmost coast where red cedar did not thrive or was absent completely. As part of the bicentennial of the Constitution celebration of 1987, the National Park Service and the Sealaska Heritage Foundation (now Sealaska Heritage Institute) sponsored the carving of a Tlingit canoe using traditional tools and methods at Bartlett Cove, which is near Hoonah, Alaska. The canoe, called Yuxwch’ee Yakw in Tlingit, means Sea Otter Canoe, which was the indigenous canoe of Hoonah and was photographed by the Harriman Expedition in Glacier Bay in 1899. The canoe was constructed at Bartlett Cover in August 1987. George Dalton, Sr, born in Hoonah in 1879, and other elders with personal knowledge of canoe making traditions served as cultural advisors to the project. Lead carvers Nathan Jackson, Steve Brown, Richard Dalton, and Mick Beasley carved the canoe using a Sitka Spruce log using traditional tools, such as the xot’ah or Tlingit adze. The Stillaguamish Tribe live along the Stillaguamish River basin (map) of Northwestern Washington State. They are a tribe which missed out on any reservation land in the 1850s and have struggled somewhat at times to maintain cultural identity as a diaspora. Regaining Federal Status in 1976 was important to the tribe of about 200 members, as was 2009’s first “First Salmon” ceremonies in a generation. An interesting and encouraging development seems to be the recent carving of the first Stillaguamish river canoe in a century. While the larger dugout canoes (still being carved) of the outer coast nations, such as the Haida and Nuu-chah-nulth, are better known emblems of the Northwest Coast as a whole, these river canoes were equally important to the inland waterway and riverine nations of the Fraser Valley and Puget Sound. According to an informative and well-written article in the Everett HeraldNet, the story starts with an interesting origin of the cedar log itself. Parts of a Makah whaling canoe. Source: Waterman, 1920. 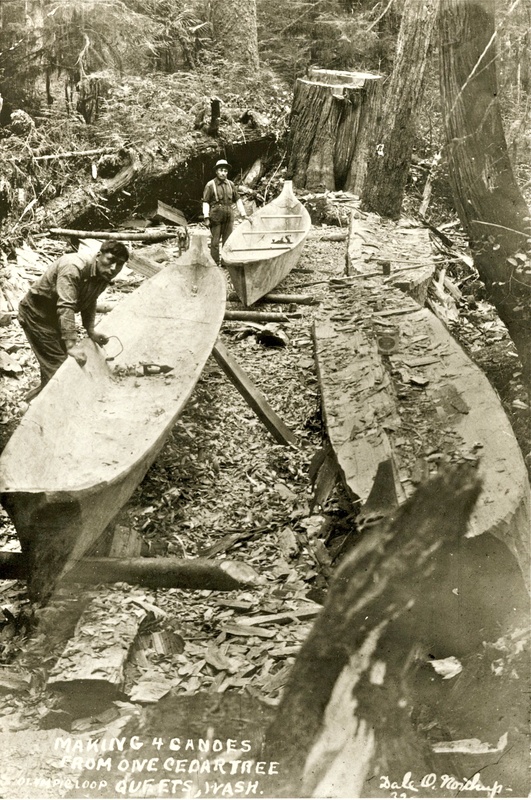 I posted a couple of days ago about a historic photo of members of the Quinalt Tribe making canoes in the Queets watershed. Immediately to the north, the Makah tribe at the tip of the Olympic Peninsula are well known for their succesful whale hunting practices, carried out from canoes similar to those being carved. As it happens, in 1920 the Anthropologist T.T. Waterman wrote a detailed account of Makah whaling technology, which you can download in full here (PDF). Above, I illustrate the nomenclature of the Makah whaling canoe – I like how the small bump on the lower bow is called the uvula. Below, you can see the seating plan when geared up and loaded for whale. 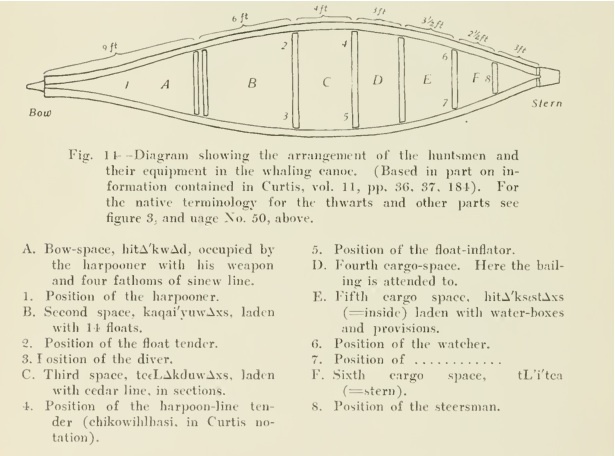 As you might expect for such a dangerous undertaking as killing whales from a canoe, the division of labour is quite precise: “float-tender”, “harpoon line tender”, “float inflator” . The “diver” had the task of swimming to the lower jaw of the dead whale, piercing the skin and flesh, and sewing the mouth shut to prevent the whale sinking on the long tow home. You can see a vivid picture of some of these people further below. 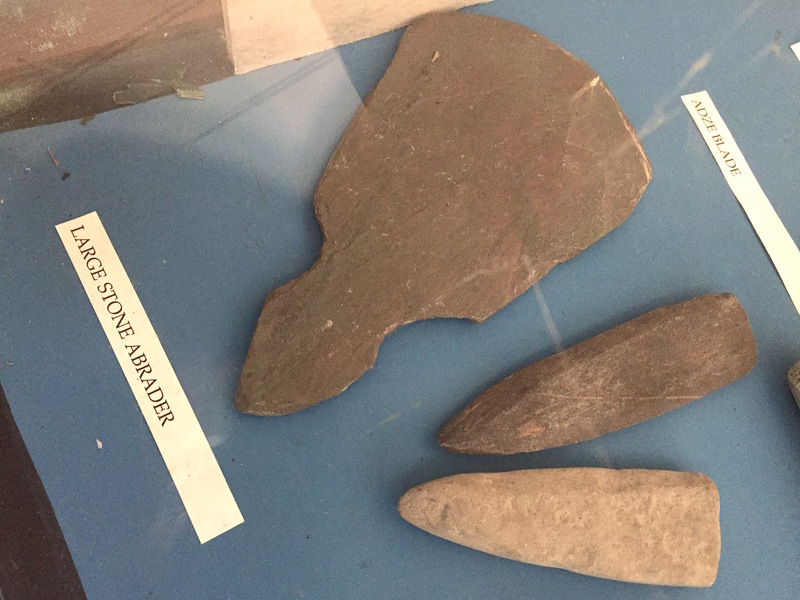 Descriptions of these tasks and the associated gear is given in Waterman, which contains huge insight into traditional Northwest Coast technology and social practice. I’ll most likely post more snippets from this book in due course. The Makah have, of course, recently re-asserted their traditional right to hunt whales which I fully support. 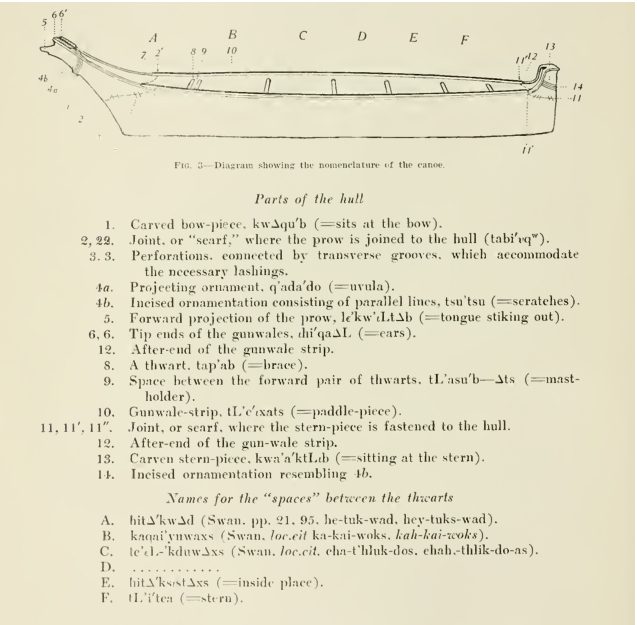 Seating positions within a Makah whaling canoe. Source: Waterman, 1920. Makah Whaling: the 2nd harpoon strike. Line tender in action behind the harpooner. Source: Makah Tribe.